MOEmentum is a bright green and black robot designed to possess and kick soccer balls from any field zone into our home zone. MOEmentum can target the goals with its camera and has multiple autonomous programs from each zone. 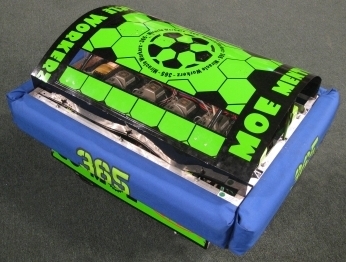 Sensors to detect when ball is "captured"
Modular kicker with adjustable tensioning system. Camera to lock in on goal from most areas on the field. Ability to climb over bumps. Download the MOEmentum 2010 Spec Sheet.